Bringing the Zen architecture to mobile devices, Raven Ridge APUs are making their way to laptops just in time for the holiday season. 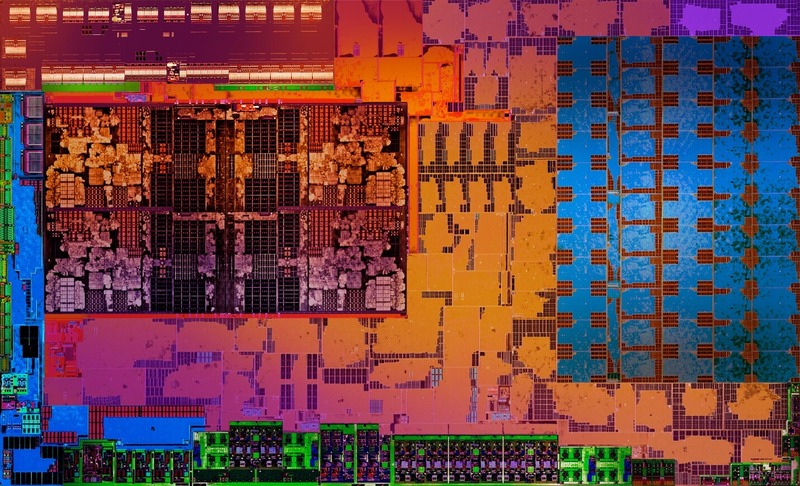 Targeting ultrathin and 2-in-1 devices, the AMD Ryzen 7 2700U and Ryzen 5 2500U combine Zen with Vega graphics into an SoC for greatly improved performance. 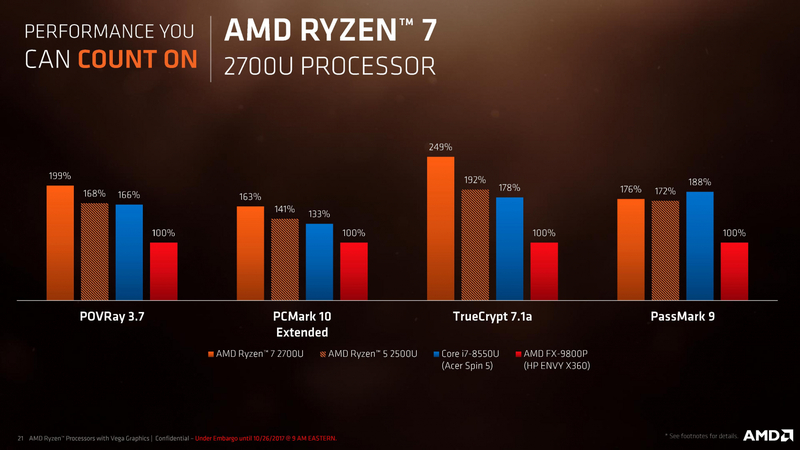 The Ryzen 7 2700U boasts 144% more performance in multi-threaded tasks compared to Intel's i7 8550U and also claims 161% greater graphics performance. 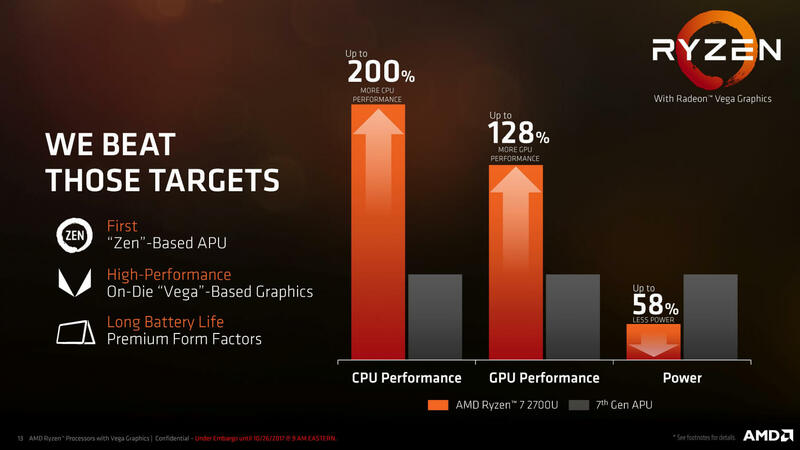 Even though these numbers are for synthetic benchmarks, real world performance could be promising. Both the Ryzen 7 2700U and Ryzen 5 2500U feature 4 cores with 8 threads attached to Vega GPU cores through an Infinity Fabric interface. A configurable TDP allows for a range of 9W to 25W with 15W being considered the nominal TDP. As part of AMD's SenseMI technology, Precision Boost 2 dynamically adjusts clock speeds in 25MHz increments assuming that power consumption and temperatures are in check. Unlike other Ryzen CPUs, each of these Raven Ridge APUs have only one Core Complex (CCX). Implementing only a single CCX is an important step forward for reducing power consumption enough to lower temperatures and fit Ryzen into slim devices. For devices that have upgraded cooling capabilities, AMD will provide certification for extended frequency ranges. Devices that can pass AMD's Ultimate XFR Performance certification, Precision Boost 2 will be more aggressive in raising both CPU and GPU clock speeds. The Ryzen 5 2500U differentiates itself from the 2700U with only 8 instead of 10 graphics compute units. It also has a lower GPU clock at 1100MHz instead of 1300MHz. Both APUs feature 2 MB of L2 and 4 MB of L3 cache. Up to 2400 MHz DDR4 RAM is supported in a dual channel configuration, although some OEMs may resort to running only a single channel. Gaming performance on these low power APUs is expected to be reasonably good considering that these are not intended to be used for extreme performance needs. The Vega GPU cores chosen for both APUs are capable of providing playable performance for many popular titles. Running on an HP Envy X360 with Ryzen 7 2700U and configured with 8 GB of RAM, less demanding games can easily remain over 30 FPS at 1080p. Lowering the resolution will be required for more intensive games, but considering the size and weight of HP's X360 thin and laptop as well as battery life, this is a reasonable compromise. In terms of efficiency, Ryzen Mobile has come in above expectations. AMD set a goal in 2014 to increase energy efficiency by a factor of 25 by 2020. Compared to just three years ago, Raven Ridge is nearly six times more efficient than Kaveri which launched in 2014. At least three different laptops with Ryzen Mobile will be available by the end of November. The HP Envy X360, Lenovo IdeaPad 720S, and Acer Swift 3 will all be available with Ryzen inside. Dell, Asus, and other OEMs are expected to release their own laptops with Ryzen Mobile in early 2018.